SIX hundred lucky guests will be checking the letterbox following news that invites for the royal wedding of the year (sorry Eugenie) have been issued. 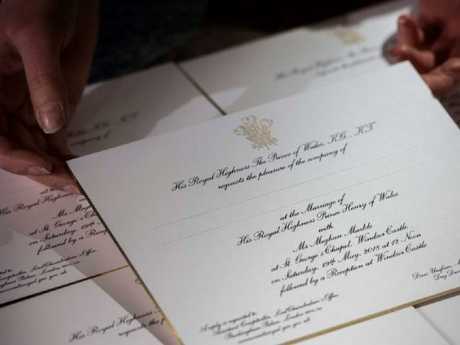 Kensington Palace announced on Thursday the handmade invitations have been produced by Barnard and Westwood, a company that holds a Royal Warrant for printing and bookbinding for the queen. Who needs Paperless Post when you can have your own calligrapher? The invite is die-stamped in gold and burnished and features the "three feather" badge of the Prince of Wales with guests names to be added by a calligrapher. Managing director Austen Kopley said the company was "thrilled" to create the sought-after invite. Exactly who makes the cut for the royal wedding remains a mystery but there are reports the Spice Girls, Elton John, as well as Prince Harry's exes Cressida Bonas, Chelsy Davy and reported one-time love Ellie Gouding could attend. 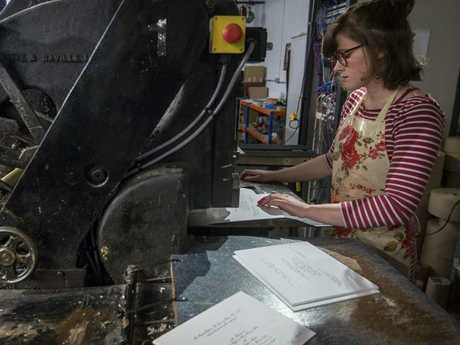 Lottie Small working the press of the royal wedding invites. Picture: Victoria Jones/Pool via AP. Former US President Obama was also tipped as a guest however may be avoided lest it be interpreted as a snub to President Trump. Meghan Markle's friends Priyanka Chopra and Misha Nonoo are also likely to be there. Six hundred will receive invites to the 12pm service at St George's Chapel with a reception at St George's Hall to follow. Later that night, around 200 will go to a private party at Frogmore House where the loved-up couple's nearest and dearest will party. The invites are the latest details to be made public ahead of the May 19 nuptials. It comes after bookmakers suspended betting amid reports Meghan's dress will be made by Australian designers Ralph and Russo. 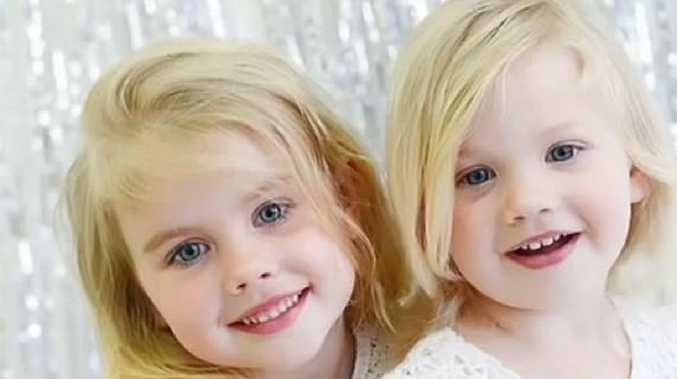 The couple have also announced they will have a lemon and elderflower cake made by a Claire Ptak of Violet Bakery - who Meghan once interviewed for her lifestyle blog, The Tig. "I can't tell you how delighted I am to be chosen to make Prince Harry and Ms. Markle's wedding cake," Ms Ptak said.